29. August 2015 22. September 2015 s.
This article (part 2 of 2) describes the process of grammaticalization of the Omaha-Ponca (Siouan, North American) morpheme ama in terms of RRG, including examples employing it in its various stages of grammaticalization. 29. August 2015 6. 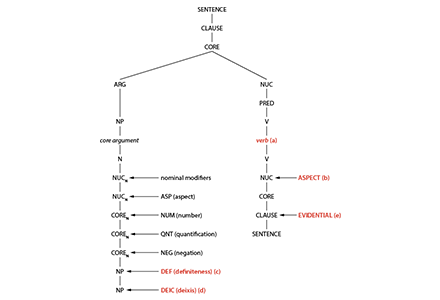 September 2018 s.
The three main syntactic functions of the Omaha-Ponca morpheme ama (auxiliary, article, evidential) in their various uses and their semantics and functional variants are analysed under the hypothesis of grammaticalization in different stages. This is part 1 of 2 parts of the article.